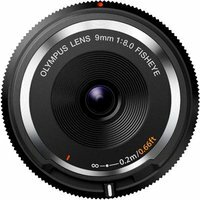 The Olympus 9mm f8 Fisheye Body Cap Lens in black is designed for use with compact system cameras that have a Micro Four Thirds fit. The fisheye lens with fixed 9mm focal length provides extreme, attention-grabbing fisheye shooting perspectives and enables you to create a variety of unusual compositions even when shooting ordinary subjects. The simplified MF (Manual Focus) lever lets you switch between deep focus and close-up shooting with a single action. At just 12.8mm thick and weighing only 30g in weight, the Olympus 9mm f8 Fisheye Body Cap lens takes mobility to a whole new level.